2. 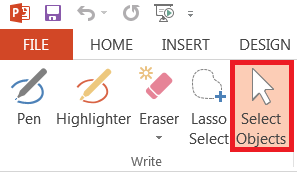 In PowerPoint, touch the Wacom pen to the screen to activate it. This will automatically pull up the INK TOOLS/PENS tab. 3. On the far left of the tab, you will see 5 functions for using the pen. 4. The first function is Pen. This function allows one to write on slides using the Wacom pen. NOTE: This will only write on the slides, not the rest of the Powerpoint screen. 5. The second function is the Highlighter. 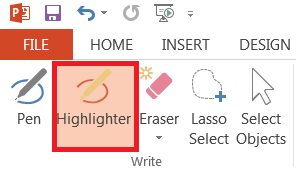 This allows one to highlight anything on a slide. 6. 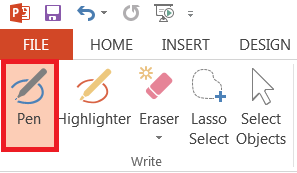 Change the color of the pen or highlighter by selecting the color of ink in the pens window. One can also select the Color button and select from a wider range of colors. Change the thickness of the writing by clicking the Thickness button and select a thickness. 7. 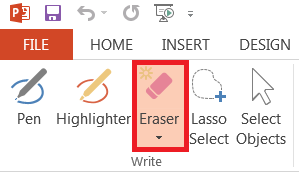 Erase written objects by selecting Eraser and dragging across the screen. One can also use the other side of the pen to erase. NOTE: When erasing ink on a slide, the eraser will erase wholes lines of ink. Anything connected to the line you wish to erase will be erased also. 8. 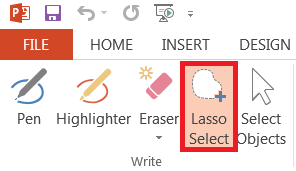 Lasso Select allows one to select a large group of ink on a slide. 9. Select Objects allows the pen to act like a regular mouse, one can click and highlight things in the same fashion as a normal mouse. 10. Stop using the pen by clicking the Stop Inking button the top right of the PENS tab. 11. While presenting, control the presentation with the pen by using the buttons in the lower left corner of the screen. 12. Keep markings on slides by clicking Keep at the end of the presentation. Select Discard to remove them.